Search engine optimisation is the process through which websites are designed & modified to rank higher and convert hits to sales. Old websites act as brochures, optimised websites are so much more – a complete marketing solution. It works best for companies with a strong focus on a specific business area, and who have a clear knowledge of there target market. I add statistics software which allows the marketing campaign to be further refined over time. By monitoring hits, the pages the visitors they have clicked on, and even what customers typed into Google to find you, websites design and development can be steered to maximise profit. It requires an understanding of your business area, matching the presentation of your company to your target customer, as well as my specialist knowledge of how Google works, and my great copywriting and design skills. 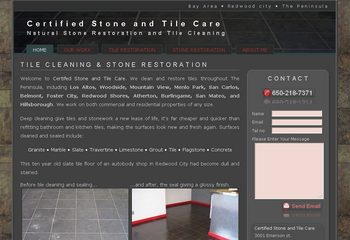 Tile cleaner and stone restorer Matt Podoll wanted an online presence to be his sole avenue for new business. The budget was tight, but it needed to bring in enough work to be in the sweet spot for a contractor, able to cherry pick the best and most lucrative projects without getting dragged away from his area of expertise. 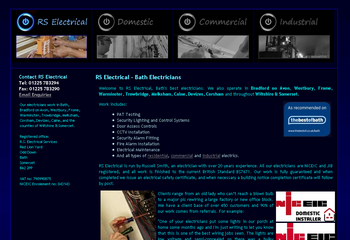 The resultant website brings in a steady stream of quotes and enquiries, enough to keep him busy throughout the year. “Thanks to you we’re getting up to 5 sales queries a day.” Chris, SWM, Somerset. As coding and design influence a website’s ranking it’s better to get involved early in the design process. I often tweak and modify websites I manage, updating images and rewriting content too as required. Call me for more information and I will be happy to help.